Saccharomyces cerevisiae maintains a large family of hexose transporters encoded by the HXT genes. The major transporter genes, HXT1 through HXT7, were sequenced from four vineyard isolates and two commercial wine yeast strains and compared to the sequences in the Saccharomyces Genome Database for strain S288C and to those available for two additional wine strains V5 and RM11-1a. Base pair changes leading to differences in amino acid sequence were found for all seven transporters. Differences ranged from none to eight amino acid variations for the sequenced strains, depending upon the strain and the gene, in comparison with S288C. In contrast, RM11-1a displayed high degeneracy with multiple in-frame stop mutations for HXT1, HXT4, and HXT6. Several wine strain sequences for the HXT4 gene contained an identical additional 16 amino acids at the C-terminus. Transporter protein levels were analyzed in a wine yeast strain (UCD932) using green fluorescent protein tagging. HXT5, not shown to be expressed in previous studies, was expressed in UCD932 during fermentation. Expression of HXT4, a prominently expressed transporter in laboratory media, was not detected. 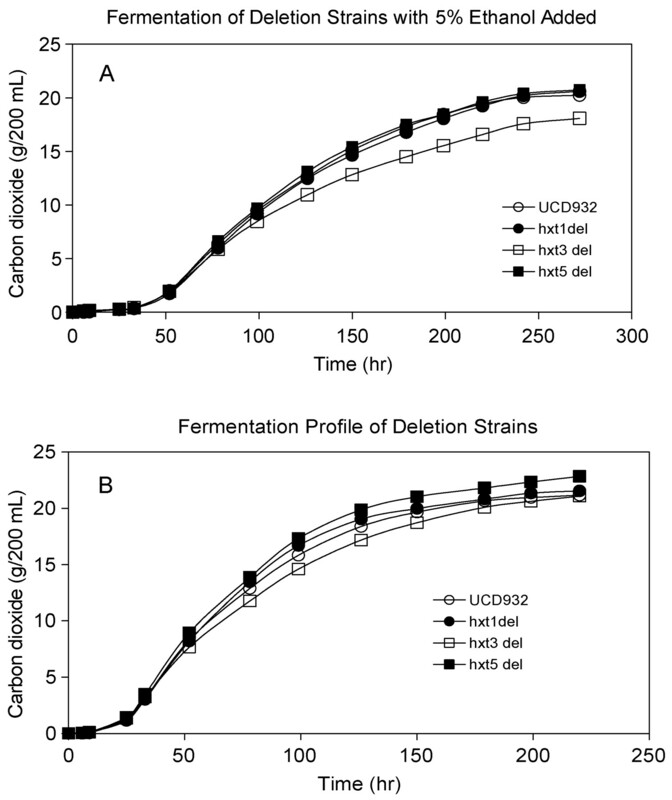 Deletion of HXT1, HXT3, or HXT5 did not result in a discernable phenotype in UCD932 under the fermentation conditions used in this study as compared with the wild type strain. However, the strain lacking HXT3 was unable to complete the fermentation in media containing 5% exogenous ethanol. This result suggests that correct expression of HXT3 may play a role in ethanol tolerance. The transport of sugars across the plasma membrane is the critical step in the utilization of glucose and fructose by yeast during wine fermentation. Saccharomyces cerevisiae possesses a large family of hexose transporter genes, termed “HXT” for HeXose Transport. Members of this family include the genes designated HXT1 to HXT17, GAL2, and the glucose sensors SNF3 and RGT2. During fermentation, S. cerevisiae faces highly changing environmental conditions as the sugar concentration decreases over a thousand-fold range while the ethanol content increases significantly, and most of the sugar is consumed by nitrogen-starved or nonproliferating cells. Nitrogen starvation and ethanol are two particular stresses that can have negative effects on the activity of membrane proteins (Leao and Van Uden 1982). In addition, because of its stereochemistry, glucose is consumed more quickly than fructose, meaning that the relative concentrations of glucose and fructose will change from roughly equimolar concentrations to pure fructose at the later stage of fermentation. Much of the information published about individual hexose transporters thus far has been gleaned from the expression of each protein in the hxt null yeast strain (hxt1Δ through hxt7Δ) (Reifenberger et al. 1997) or the transporter-less yeast strain (hxt1Δ through hxt17Δ, gal2Δ) (Wieczorke et al. 1999). This research suggests that all of the hexose transporters, if present in sufficient amounts (except for HXT12, which is a pseudogene), have the intrinsic capacity to transport glucose or one of the other hexoses. The physiological functions of these transporters when expressed under native conditions remain largely unknown. The analysis of the hexose transporter proteins in wine strains can provide unique insight into the roles of these proteins in native environments. Several studies have described the expression of the hexose transporters during alcoholic fermentation of grape or synthetic must using a wine yeast strain. The first seven HXT genes were previously identified as the major transporters involved during wine fermentation (Reifenberger et al. 1997). These seven transporters differ in their substrate specificities and affinities, as well as their expression patterns and regulation, with glucose being the primary factor controlling expression (Luyten et al. 2002, Perez et al. 2005). The existence of functional differences in regulation of expression of the hexose transporters among strains has also been reported. One study found that HXT5 was expressed in a laboratory strain according to growth rates (Verwaal et al. 2002), but another found no evidence of HXT5 expression in a wine strain during fermentation (Perez et al. 2005). In addition, dissimilar behaviors of HXT6 and HXT7 from laboratory and wine yeast strains despite high sequence identity have been reported (Reifenberger et al. 1997, Luyten et al. 2002). These results suggest hexose transporters may have evolved to play different roles in genetically distinct wine yeast strains. Alternately, the indirect methods of analysis used in these studies, such as use of reporter gene fusions, may have influenced estimates of relative expression levels. To determine the extent to which these differences in expression may be due to differences in the amino acid sequence of the protein, the HXT1 through HXT7 transporter genes were sequenced in four cellar isolates and two commercial wine strains and compared to the previously reported sequence analysis for V5 (Luyten et al. 2002) and the released sequence for RM11-1a (www.broad.mit.edu/annotation/genome/saccharomyces_cerevisiae.3/Home.html). The RM11-1a strain is a vineyard isolate from California previously shown to display significant protein sequence divergence and a rapid rate of evolution, suggesting that in native isolates there is a slow selection against mildly deleterious alleles (Ronald et al. 2006). Deletions of the major transporter genes were generated in UCD932 and the impact on fermentation and growth parameters evaluated. In addition, expression was evaluated using fluorescently tagged transporter proteins in strain UCD932 during fermentation of synthetic juice. Fluorescent protein fusions allow direct observation of live cells with minimal perturbation and allow assessment of subcellular localization as well (Tsien 1998). The S. cerevisiae wine strains used in this study were UCD522 (commercial, Montrachet), UCD932 (Ba2, Lambrusco must isolate), UCD935 (Ba30, Lambrusco must isolate), UCD939 (Ba99, Lambrusco must isolate), UCD940 (Ba111, Albana must isolate), and UCD2031 (commercial, Cote des Blancs). UCD932, UCD935, UCD939, and UCD940 are homozygous diploid, homosporic isolates of wine yeast from different Italian wineries (Mortimer et al. 1994) and were previously found to display differences in fermentation performance (Dietzel and Bisson, unpublished observations, 2005). UCD522 and UCD2031 are isolates of the indicated commercial wine yeast from the UC Davis Department of Viticulture and Enology Wine Microbe Culture Collection and are likely not homozygous. Cultures were prepared in YEPD liquid medium (1% yeast extract, 2% bactopeptone, and 2% dextrose) by incubation for 12 hr on a yeast roller drum at 25°C. Selection for geneticin resistance was made with YEPD plates supplemented with 300 mg/L of G418 sulfate (Sigma, St. Louis, MO). Spores were prepared by transferring diploids into 0.5% potassium acetate liquid medium and incubating at 25°C for 3 days (Sidoux-Walter et al. 2004). Escherichia coli DH5α were used for plasmid preparation. Escherichia coli cultures with plasmids were prepared in LB liquid medium (0.5% yeast extract, 1% bactotryptone, 0.5% NaCl), supplemented with 100 μg/mL ampicillin, by incubation for 12 hr at 37°C. Sequencing of the HXT genes. Sequencing of HXT1 through HXT7 was performed according to standard procedures. Genomic DNA was collected from the wine strains and used as a template for high-fidelity PCR. A typical PCR reaction consisted of 30 cycles: 94°C for 1 min, 55°C for 1 min, 68°C for 2 min, using Platinum Taq High Fidelity DNA Polymerase (Invitrogen, Carlsbad, CA). This polymerase has proofreading activity to reduce errors. In addition, multiple primer pairs were used to ensure that sequences for each gene were overlapping so that sequencing errors could be identified (primer sequences are available upon request). These PCR products were submitted for sequencing to CBS Sequencing at UC Davis (http://dnaseq.ucdavis.edu/). Sequences were aligned using BioEdit software and compared to the published sequence in the Saccharomyces Genome Database (www.yeastgenome.org). Multiple sequence alignments were produced using the ClustalW program. All new HXT allele sequences were submitted to GenBank: UCD935 HXT1 (EU196735), UCD932 HXT2 (EU196736), UCD932 HXT6 (EU196737), UCD932 HXT7 (EU196738), UCD939 HXT3 (EU196739), UCD939 HXT5 (EU196740), UCD2031 HXT3 (EU196741), UCD2031 HXT5 (EU196742). Identical alleles (identical DNA sequences) to those already or previously submitted (for strain V5) found in different strains were not submitted to GenBank. The sequencing protocol employed readily identified heterozygosities at the HXT alleles in these strains. Subsequent genetic and sequencing analysis confirmed the existence of multiple alleles. GFP-tagging of the HXT genes. Chromosomal C-terminal green fluorescent protein (GFP) tags were constructed for HXT1 through HXT7 using an insertion cassette that was amplified from plasmid pFA6-GFP-Kan (Wach et al. 1994). Primer sequences are available upon request. Each cassette was individually transformed into UCD932 using the lithium acetate method and transformants selected for on YEPD plus 300 mg/L G418 plates. Positive transformants were verified by PCR and DNA sequencing. The resulting GFP fusion proteins consist of the gene of interest connected to the GFP protein by a linker region of approximately 10 amino acids. The homozygous GFP strain was constructed by sporulating the heterozygous strain. Construction of disruption alleles of HXT genes. HXT1, HXT3, and HXT5 were deleted by the one-step gene replacement method using the hygromycin resistance cassette (amplified from plasmid pYM40) (Janke et al. 2004). Primer sequences (homology ~40 bp) are available upon request. After transformation, cells were incubated 2 to 4 hr at 25°C in YEPD, washed once in sterile water, and plated on YEPD plates plus 300 mg/L hygromycin (Sigma, St. Louis, MO). After 48 hr at 30°C, the colonies were restreaked on fresh YEPD plates plus hygromycin to confirm resistance. Homozygous hxt-null mutants were generated by sporulation of the heterozygous mutant and separation of the resulting spores. All gene knockouts were verified by PCR. The GFP strains were grown in minimal must medium (MMM) (Spiropoulos et al. 2000) containing 11% of both glucose and fructose at 25oC with agitation. The assimilable nitrogen level (467 mg/L) was produced by adding 0.8 g/L arginine and 1 g/L diammonium phosphate to the medium. Fermentations were carried out in 200 mL of medium contained in 500 mL Erlenmeyer flasks, closed with foil to achieve semianaerobic conditions. Strains were grown to stationary phase in 10 mL MMM and then used to inoculate 200 mL medium with a starting OD600 ≈0.03. One mL aliquots were removed at different intervals throughout the fermentation and immediately observed using a fluorescence microscope (Zeiss Axioscope) set for GFP wavelengths at 100X magnification. Cells were immobilized in agarose before observation. For ethanol tolerance studies, 10 mL 100% ethanol was added before inoculation for a final concentration of 5%. Cell growth and ethanol production were monitored by optical density and flask weight loss, respectively, until flask weight remained constant, usually after about 7 days (160 hr). Weight loss data was corrected for evaporative loss and for sampling loss by subtraction and is reported as g CO2/200 mL medium. Final ethanol levels were calculated using the total CO2 produced measured by flask weight loss. Fermentations were performed in triplicate. The major hexose transporter genes in multiple wine yeast strains were sequenced and compared to the published sequences in the Saccharomyces Genome Database for laboratory strain S288C, to the sequence for RM11-1a (www.broad.mit.edu/annotation/genome/saccharomyces_cerevisiae.3/Home.html) and to published data for strain V5 (Luyten et al. 2002) (Table 1⇓). Four isolates from independent wineries were used: UCD932, UCD935, UCD939, and UCD940 (Mortimer et al. 1994). These isolates display different phenotypic traits (Mortimer et al. 1994) and are therefore genetically distinct, although, since they were isolated from the same region, they may show significant genetic similarity. Two unrelated commercial strains of S. cerevisiae var. cerevisiae were also used: UCD522 and UCD2031. These isolates originated in France and have been maintained commercially for nearly 30 years. These strains represent a sampling of the diversity of wine strains of S. cerevisiae. All strains showed a single allele for each of the HXT transporters sequenced with the exception of UCD2031. UCD932 was the only wine strain found to have an identical sequence to the SGD sequence for the HXT1 gene. With the exception of RM11-1a, all of the other wine strain sequences were found to contain five additional amino acid changes (Table 1⇑). In addition, UCD935 and UCD939 contained a conservative substitution: V61A. The clustered triple amino acid change from DQP to NNG at positions 418–420 results in a sequence that more closely matches Hxt3p and Hxt4p at this location, GNG and KNG, respectively. The remainder of the major hexose transporters (Hxt2p, Hxt5p-Hxt7p) contain the original amino acids DQP at positions 418–420. The amino acid change to a cysteine at position 431 is also interesting since the other yeast hexose transporters (Hxt2p through Hxt17p, Gal2p) contain a valine at this position. The amino acids at positions 418–420 and 431 are predicted to be in the loop between helices 9 and 10 or possibly at the beginning of helix 10. These amino acid changes may have a functional effect on the protein since the residues are on the exofacial side of the protein. This is consistent with a previous study of an altered HXT3 sequence (Guillaume et al. 2007). In this altered protein, six of the 10 altered amino acids identified were located in membrane spanning regions 9 or 10 and the loop in between. Interestingly, the strain UCD932, which displays the same sequence as the laboratory strains, is generally a poorer fermentor more similar to laborator y strains than the other stains evaluated in this study. Although a wider selection of strains would need to be sequenced, the appearance of the same amino acid alterations across strongly fermenting vineyard isolates and commercial strains suggests that these changes in the Hxt1 protein may be important in fermentation performance. In sharp contrast, the RM11-1a strain shows significant variation in the N-terminal region (residues 50–105) of HXT1, including the presence of multiple in-frame stop codons (Figure 1⇓), suggesting this protein is not functional in this strain. 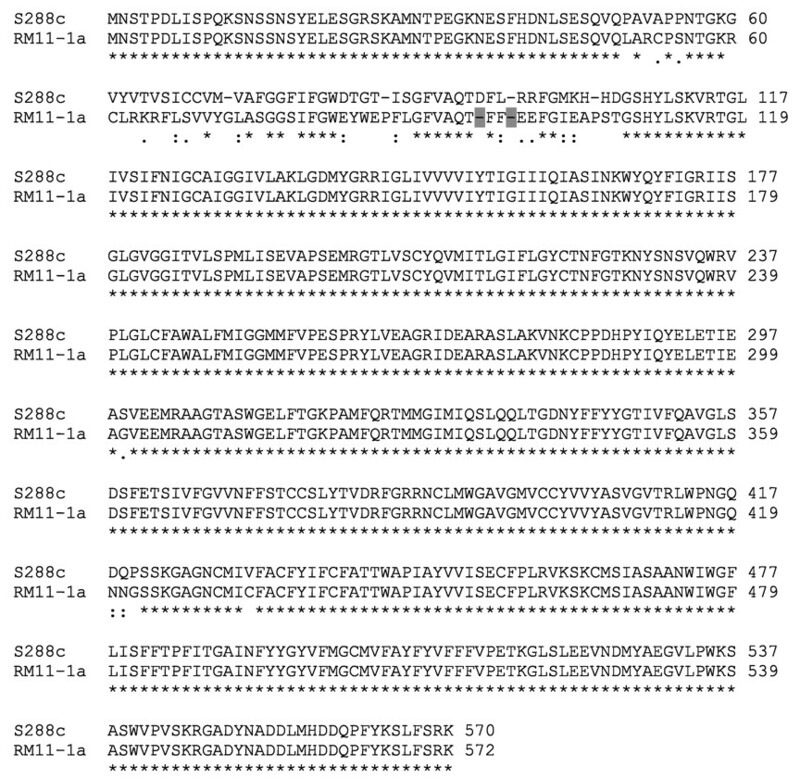 Clustal alignment of HXT1 gene sequences for S288C and RM11-1a. Key: shaded box indicates an in-frame stop codon; * indicates an identical amino acid residue; : indicates a conservative amino acid residue change;. indicates a semiconservative change; blank space indicates a nonconservative change. All of the wine strains that were sequenced were found to contain only a single amino acid substitution in Hxt2p: F119I. This change was found in RM11-1a as well. The V5 strain displayed an additional change: I23T. For HXT3, three native, one commercial wine strain and RM11-1a have the identical sequence to S288C (Table 1⇑). UCD939 was found to contain a T371S substitution. UCD2031 carries two different HXT3 alleles. One allele is identical to that of S288C. The other allele contained eight amino acid changes as compared to S288C (Table 1⇑). Six of these changes are located in the cytoplasmic loop between membrane spanning regions 6 and 7. A previous study also identified a variant of HXT3 with multiple amino acid substitutions (Guillaume et al. 2007). The HXT3 gene from this strain contained 10 amino acid differences as compared to the Saccharomyces Genome Database sequence. There were no similarities in amino acid substitutions between this strain and UCD2031 for the HXT3 gene. The SGD strain contains an HXT4 gene made up of a 1683-bp ORF with a deduced protein of 560 amino acids. Interestingly, all of the wine strains sequenced herein were found to contain a 1731-bp HXT4 sequence and a deduced protein made up of 576 amino acids including a lengthened C-terminal tail (sequence = LMHDDQP-FYKKMFGKK). This lengthened tail of Hxt4p actually is more homologous to the C-terminal tails of the other yeast hexose transporters than the C-terminal tail of the S288c HXT4 protein. There were no other amino acid substitutions found in Hxt4p for these strains. However, the V5 strain was shown to contain a nonsense mutation in HXT4 and does not express this protein (Luyten et al. 2002). Similarly, the RM11-1a strain displays multiple in-frame stop codons in HXT4 (Figure 2⇓), and it would not be expected to express a functional protein. These observations are intriguing. Those strains possessing a functional Hxt4p show high sequence identity with the exception of the C-terminal extension. Yet two strains show a disruption of the protein reading frame that would preclude expression of Hxt4p. Clustal alignment of HXT4 gene sequences for S288C and RM11-1a. Key: shaded box indicates an in-frame stop codon; * indicates an identical amino acid residue; : indicates a conservative amino acid residue change;. indicates a semiconservative change; blank space indicates a nonconservative change. RM11-1a, UCD932, UCD935, and UCD940 display the identical HXT5 sequence as compared with S288C (Table 1⇑). The two commercial wine strains that were sequenced, UCD522 and UCD2031, contain a single amino acid change in Hxt5p: Y40N. UCD939 contained two changes in Hxt5p: K73N and Y457F. The residue at position 73 is not a conserved amino acid, while residue 457 is highly conserved in all transporters as either a tyrosine or phenylalanine. HXT6 and HXT7 are nearly identical genes in S288C. The nucleotide sequences of HXT6 and HXT7 in this strain differ by only three base pairs and the proteins differ by one amino acid at position 556: Hxt6p contains an alanine while Hxt7p contains a threonine. Interestingly none of the wine strain sequences for Hxt6p and Hxt7p were found to differ from each other at position 556 except UCD2031, which retained the same threonine as the S288C sequence in the HX T7 gene. UCD2031 was also found to be heterozygous for HXT6 and HXT7, containing an allele identical to the S288C sequence for both genes. UCD522, UCD932, UCD935, UCD939, and UCD940 were found to contain two amino acid changes in Hxt6p, V293I and P448A. The second allele found in UCD2031 only contained the P448A change. These substitutions were also found in Hxt7p, alt houg h UCD932, UCD935, UCD939, and UCD940 retained t he proline at posit ion 4 48. RM11-1a displayed multiple nonsense mutations in HXT6 (Figure 3⇓) similar to what was observed for HXT4 in this strain. The V5 strain displayed six amino acid substitutions in HXT7 and RM11-1a HXT7 allele displayed 22 amino acid differences, two of which (F224Y and N228T) were identical to those found in V5. 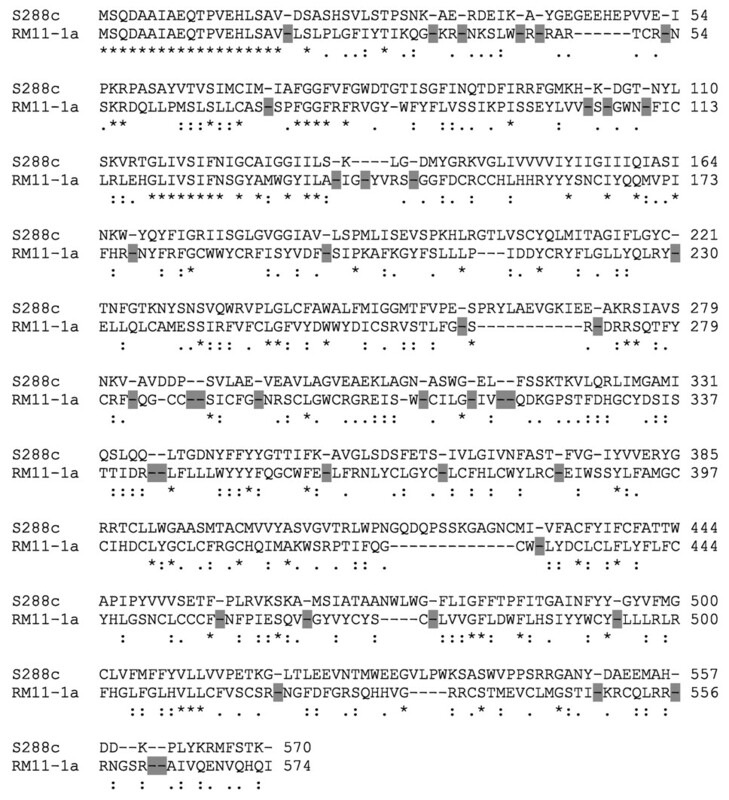 Clustal alignment of HXT6 gene sequences for S288C and RM11-1a. Key: shaded box indicates an in-frame stop codon; * indicates an identical amino acid residue; : indicates a conservative amino acid residue change;. indicates a semiconservative change; blank space indicates a nonconservative change. The analysis of the sequencing data for all nine strains (five native isolates including RM11-1a, three commercial strains including V5, and one laboratory strain) indicated general conservation of sequences but also a striking sequence diversity among subsets of this gene family. The most highly conserved genes are HXT2, HXT3, and HXT5. HXT4 is shows high sequence similarity in those strains expressing this gene, but two of the nine strains had nonfunctional alleles of this transporter. HXT6 and HXT7 generally maintain the high sequence similarity previously reported for S288c, with a couple of allele differences. The fact that the differences between these two genes are present in both HXT6 and HXT7 in the same genetic backgrounds suggests either these genes diverged independently in the different strains or recombination events occur that result in sequence homogenization. Isolate RM11-1a, a strain isolated from a vineyard in California, carries three nonfunctional HXT transporter genes: HXT1, HXT4, and HXT6. This strain was considered to be rapidly evolving as compared with S288C (Ronald et al. 2006). The lack of similar changes in other vineyard isolates suggests this is not a common property of wild strains. Strain UCD932 generally displayed the most common alleles for the transporter genes with the exception of HXT1. It was selected for further study to characterize the localization of the HXT proteins and the changes during fermentation. The impact of deletion of members of the HXT family on growth and fermentation profiles was also evaluated in UCD932. GFP fusion proteins were constructed with the seven major hexose transporter genes individually in UCD932 in order to follow protein localization and turnover during fermentation in a qualitative manner. GFP fusions of plasma membrane hexose transporter proteins have been shown to be functional (Malinska et al. 2003, Kruckeberg et al. 1999). There were no significant differences in the fermentation (Figure 4A⇓) and growth profiles (data not shown) between the GFP strains and the UCD932 parental strain. Representative growth and fermentation profiles strains. Strains expressing individual GFP fusion proteins were fermented in MMM. Fermentation progress was monitored by weight loss, corrected for evaporative loss and reported as grams of carbon dioxide lost corrected per 200 mL medium. A: absence of ethanol; B: presence of 5% ethanol at the beginning of fermentation. Expression levels of the hexose transporter proteins seemed to follow previously published expression data in fermentation with high nitrogen (Perez et al. 2005). The low-affinity HXT1 transporter has a maximal expression only in the presence of high extra-cellular glucose levels (Ozcan and Johnston 1999). Accordingly, Hxt1p expression was observed early in the fermentation (5–13 hr) when sugar levels were high, but the protein was rapidly endocytosed after the beginning of log phase growth (~30 hr) and vacuolar fluorescence was greatly diminished by 60–80 hr (Figure 5⇓, Table 2⇓). This expression pattern was also in agreement with Lewis and Bisson (1991), who observed maximal expression of the HXT1 promoter during lag and early exponential growth phase with a large decrease later into exponential phase. However, another study did not observe any transcript levels of HXT1 during the exponential growth phase of an industrial wine strain (EC1118) under enological conditions (Varela et al. 2005). Relative GFP expression data for each Hxtp-gfp strain. Fluorescence pictures of HXT1-GFP strain during fermentation. Cells were harvested from fermentation flask and immobilized in agarose before viewing at 100X magnification. At about the same time that Hxt1p seemed to be internalized, the medium affinity Hxt3p and Hxt5p transporters were strongly expressed (Table 2⇑). These two proteins show expression throughout much of the fermentation. Hxt3p has previously been identified as a major sugar transporter during fermentation, but neither Perez et al. (2005) nor Varela et al. (2005) observed any HXT5 expression in their studies. Hxt5p has been described as a “reserve” transporter with a role in the accumulation and metabolism of reserve carbohydrates (Verwaal et al. 2002). The authors also observed that HXT5 expression was consistently induced upon a decrease in the culture growth rate. The data obtained in this study agrees with this earlier experiment, since Hxt5p was strongly induced around 50 hr when the cultures enter stationary phase (Table 2⇑). 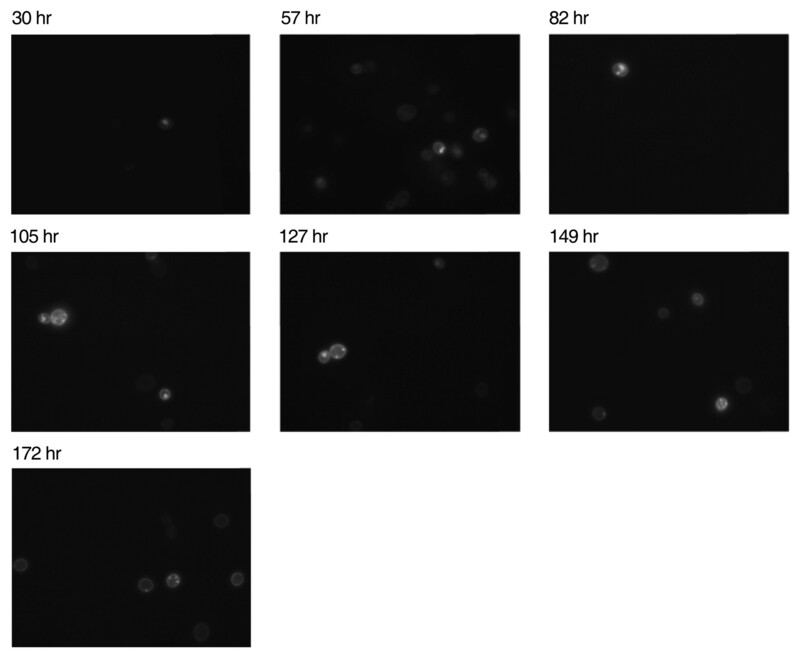 Localization of Hxt5p in the plasma membrane continued to be observed until late in the fermentation, while Hxt3p seemed to be increasingly internalized after 100 hr of fermentation. Expression of the high-affinity transporters Hxt6p and Hxt7p was observed as early as 30–50 hr in the fermentation (Table 2⇑) and membrane localization continued until the end of the fermentation. These results are consistent with the observation that HXT6/7 transcripts were expressed throughout fermentation (Varela et al. 2005). It was noted that expression of Hxt6 and Hxt7p toward the end of fermentation is very important since these proteins are much more efficient at transporting fructose than Hxt3p (Perez et al. 2005). Glucose is the preferred hexose during fermentation; therefore fructose is more prevalent toward the end of fermentation. Even though these proteins are highly related in sequence, Hxt7p expression seemed to be higher during the fermentation (Table 2⇑). Interestingly, both Hxt6p and Hxt7p showed small but bright internally localized spots of fluorescence toward the end of the fermentation (Figure 6⇓). These punctate structures were presumably endocytic vesicles (Ye et al. 2001), yet they were not observed in any of the other major transporters during fermentation. If these structures truly are endocytic vesicles, then it would seem necessary that they would disappear after reaching the vacuole, as has been observed for endocytosis of the Hxt2p transporter (Kruckeberg et al. 1999). However, that is not the case for Hxt7p in this study, as these punctate structures were frequently present when Hxt7p expression was observed during the fermentation (Figure 6⇓). Alternatively, since Hxt6p and Hxt7p were more highly expressed toward the end of fermentation, these proteins may be involved in the overall stress response of the cell (Trotter et al. 2002, Perez et al. 2005) and the punctate structures may also be associated with peroxisomes. Even though the high-affinity transporter Hxt2p has been shown to be repressed by high glucose concentrations (Ozcan and Johnston 1999), Hxt2p expression was still observed very early in the fermentation (5–11 hr) but had vanished by 33 hr (Table 2⇑). Conversely, there was no expression of Hxt2p at the end of the fermentation, when hexose concentrations may become low enough to relax repression of these genes. Perez et al. (2005) also noted expression of Hxt2p and suggested that the transient expression of Hxt2p during lag phase of the fermentation indicated a role for the protein in growth initiation. The authors did not observe Hxt4p since the HXT4 gene of yeast strain V5 has been shown to contain a nonsense mutation and does not express a functional carrier (Luyten et al. 2002). However, expression of Hxt4p also was not observed in our study. 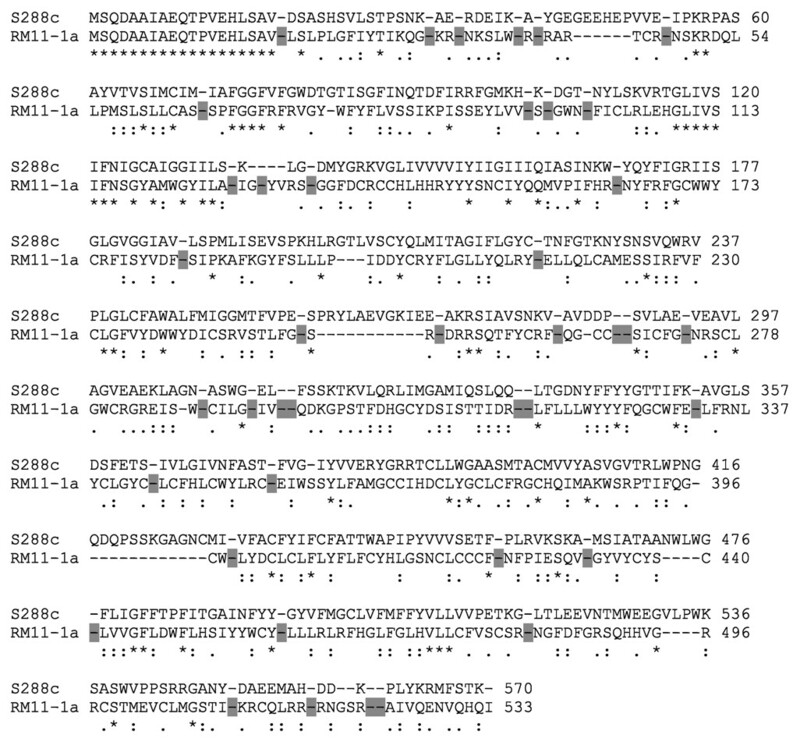 Sequence analysis indicates a functional HXT4 gene in UCD932. Varela et al. (2005) observed low expression levels of HXT2 throughout fermentation, but likewise did not observe any HXT4 expression. Thus, although HXT4 has been reported to play an important role in glucose consumption in laboratory strains under laboratory growth conditions, it does not appear to play an important role during anaerobic fermentation. The impact of ethanol on the expression patterns of the HXT genes was evaluated as ethanol perturbs membrane structures and impacts protein function and therefore may lead to changes in the localization or expression pattern of specific HXT genes. When challenged with exogenous ethanol in the MMM medium, the HXT-GFP strains displayed similar fermentation profiles as compared to the absence of ethanol addition (Figure 4B⇑), but achieved a lower final optical density compared to the normal density of ~18 OD. When ethanol was present, the parental and all of the GFP strains displayed a lengthened lag phase during the fermentation, approximately 50 hr instead of the normal 20–25 hr, and, accordingly, the expression patterns for some of the hexose transporters were seen later in the fermentation (Table 2⇑). This extended lag phase may be required for the yeast cell to change the composition of the lipids within the plasma membrane to adapt to the ethanol stress. Within this time period, Hxt1p expression was again evident early in the fermentation. No expression was observed for Hxt2p and Hxt4p. The lack of expression of HXT2 suggests that, under conditions of stress, expression of this protein is down-regulated and likely deleterious to the cell. Hxt3p and Hxt5p were expressed by 68 hr and continued throughout fermentation. Hxt6p and Hxt7p were observed around 91 hr and again displayed the familiar, punctate expression patterns. From these results, it seems that the expression of the hexose transporters is not significantly affected by the presence of 5% ethanol at the beginning of the fermentation, except that the yeast cell necessarily has to spend more time adapting to the stressful conditions. Even as the fermentation progresses, there is no sign that increased levels of ethanol are affecting the localization of these proteins. Effect of deletion of HXT1, HXT3, and HXT5. A previous study examined the effect of each individual transporter in a wine strain deleted for all seven major HXT genes (Luyten et al. 2002) and determined that four transporters were important in wine fermentation: HXT1, HXT3, HXT6, and HXT7. In contrast we noted significant expression of HXT5 in UCD932. Further, HXT3 and HXT5 are the most highly conserved transporter proteins across the nine strains evaluated. Because of their expression profiles during midfermentation, HXT1, HXT3, and HXT5 were individually deleted from the wine yeast UCD932 to identify possible phenotypes associated with loss of these genes. None of the deletion strains showed any significant defects in their growth or fermentation profiles compared with UCD932 (data not shown and Figure 7B⇓). When challenged with 5% exogenous ethanol in the MMM, the strains harboring hxt1Δ or hxt5Δ deletions did not display any significant differences in the growth profile, although all the strains required a lengthened lag phase and achieved a lower final optical density than strains fermenting in the absence of ethanol (data not shown). However, the hxt3Δ strain displayed an inability to finish the fermentation, reaching a final ethanol level of approximately 17% compared with 18.5% for the other strains (Figure 7A⇓). The fermentation progress of this strain seemed to slow when the total ethanol level approached 9–10% ethanol. This observation is in line with previous results with the S. cerevisiae BY4742 hxt3Δ strain, which displayed a defect when grown in the presence of 10% ethanol (Kumar, Goyashiki, Karpel, and Bisson, unpublished observations, 2006). The ethanol sensitivity of the hxt3Δ was verified with multiple independent deletion mutants in fermentation to rule out effects from secondary mutations. Replicate independent fermentations were conducted and the data are presented from a single experiment. In all replications the strain carrying the hxt3 deletion displayed a lower final ethanol yield. The observation that the fermentation capabilities of UCD932 are not compromised when HXT1, HXT3, or HXT5 are deleted is surprising since these proteins are thought to play an important role in sugar transport and energy production. This finding supports the robustness of the multigene family for ensuring optimized sugar catabolism and the ability to express other transporters to adjust fermentation rates in the absence of a specific gene product. Representative fermentation profiles of the deletion strains in the presence (A) or absence (B) of 5% ethanol. Strains containing hxt1Δ, hxt3Δ, or hxt5Δ mutations were fermented in MMM. Fermentation progress was monitored by weight loss and optical density. 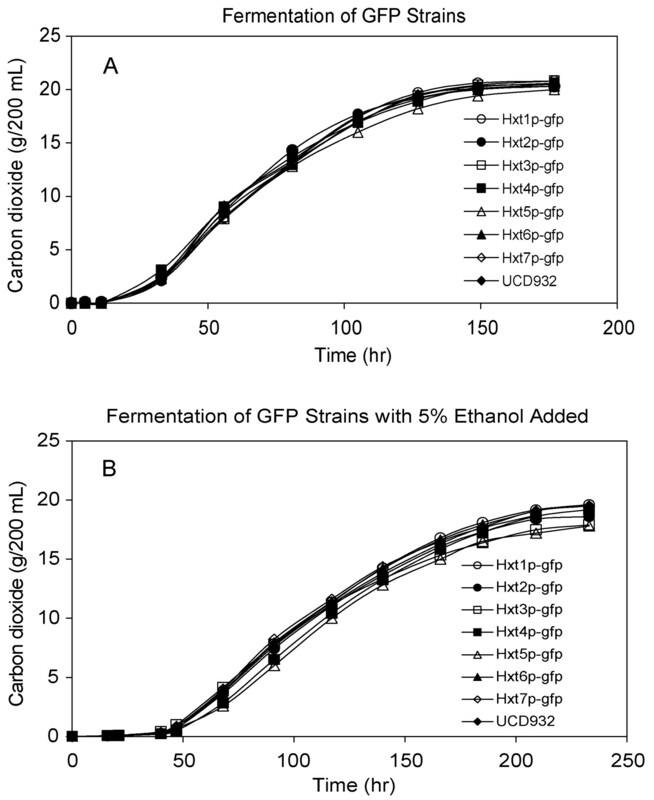 These results also highlight a difference between the growth effects of ethanol produced by yeast during fermentation and the growth effects of exogenous ethanol in the media. The hxt3Δ strain has no apparent difficulty in completing a fermentation with final ethanol concentrations above 13%, but seems unable to fully adapt when 5% ethanol is present at the beginning of the fermentation. This phenomenon has been previously described (Novak et al. 1981), that is, the extent of inhibition of fermentation by exogenously added ethanol differs from the predicted decline in fermentation rate that normally occurs during the fermentative accumulation of ethanol. The HXT genes encoded by most wine strains differ only slightly in sequence from the published sequence for a laboratory strain, but those differences may be important in the evolution of rapid and robust fermentation rates. Alternatively, the changes may be neutral (not deleterious) and define a wild isolate lineage. The similarity of HXT gene sequences of vineyard isolates and commercial strains to S288C in contrast to RM11-1a suggests that the RM11-1a strain may not represent a typical vineyard strain. Some strains display marked differences in sequence and loss of function mutations exist in several of the HXT genes. The most highly conserved genes were HXT2, expressed early in anaerobic fermentation, HXT3, expressed during midfermentation, and HXT5, which was expressed during midfermentation in our study but has not been found in other studies. Finally, the role that HXT3 may play in ethanol tolerance is intriguing. The HXT3 transporter does play a major role in energy production and loss of this transporter may affect the organism’s ability to maintain energy production levels in order to adapt to ethanol shock early in the fermentation. Further research should clarify the role of HXT3 in ethanol tolerance during adaptation. Acknowledgments: This research was supported by an NSF Graduate Student Research Fellowship, a grant from the American Vineyard Foundation and the California Competitive Grant Program for Research in Viticulture and Enology, and by the Maynard A. Amerine Endowment. The authors thank Stefan Wuertz (Department of Civil and Environmental Engineering, UC Davis) for providing access to a fluorescent microscope. Guillaume, C., P. Delobel, J.M. Sablayrolles, and B. Blondin. 2007. Molecular basis of fructose utilization by the wine yeast Saccharomyces cerevisiae: A mutated HXT3 allele enhances fructose accumulation. Appl. Environ. Microbiol. 73:2432–2439. Janke, C., M. Magiera, N. Rathfelder, C. Taxis, S. Reber, H. Maekawa, A. Moreno-Borchart, G. Doenges, E. Schwob, E. Schiebel, and M. Knop. 2004. A versatile toolbox for PCR-based tagging of yeast genes: New fluorescent proteins, more markers, and promoter substitution cassettes. Yeast 21:947–962. Kruckeberg, A., L. Ye, J. Berden, and K. Van Dam. 1999. Functional expression, quantification, and cellular localization of the Hxt2 hexose transporter of Saccharomyces cerevisiae tagged with the green fluorescent protein. Biochem. J. 339:299–307. Leao, C., and N. Van Uden. 1982. Effects of ethanol and other alkanols on the glucose transport system of Saccharomyces cerevisiae. Biotechnol. Bioeng. 24:2601–2604. Lewis, D., and L.F. Bisson. 1991. The HXT1 gene product of Saccharomyces cerevisiae is a new member of the family of hexose transporters. Mol. Cell. Biol. 11:3804–3813. Luyten, K., C. Riou, and B. Blondin. 2002. The hexose transporters of Saccharomyces cerevisiae play different roles during enological fermentation. Yeast 19:713–726. Malinska, K., J. Malinsky, M. Opekarova, and W. Tanner. 2003. Visualization of protein compartmentation within the plasma membrane of living yeast cells. Mol. Biol. Cell 14:4427–4436. Mortimer, R., P. Romano, G. Suzzi, and M. Polsinelli. 1994. Genome renewal: A new phenomenon revealed from a genetic study of 43 strains of Saccharomyces cerevisiae derived from natural fermentation of grape musts. Yeast 10:1543–1552. Novak, M., P. Strehaiano, M. Moreno, and G. Goma. 1981. Alcoholic fermentation: On the inhibitory effect of ethanol. Biotechnol. Bioeng. 27:280–285. Ozcan, S., and M. Johnston. 1999. Function and regulation of yeast hexose transporters. Microbiol. Mol. Bio. Rev. 63:554–569. Perez, M., K. Luyten, R. Michel, C. Riou, and B. Blondin. 2005. Analysis of Saccharomyces cerevisiae hexose carrier expression during wine fermentation: Both low- and high-affinity Hxt transporters are expressed. FEMS Yeast Res. 5:351–361. Reifenberger, E., E. Boles, and M. Ciriacy. 1997. Kinetic characterization of individual hexose transporters of Saccharomyces cerevisiae and their relation to the triggering mechanisms of glucose repression. Eur. J. Biochem. 245:324–333. Ronald, J., H. Tang, and R.B. Brem. 2006. Genomewide evolutionary rates in laboratory and wild yeast. Genetics 174:541–544. Sidoux-Walter, F., N. Pettersson, and S. Hohmann. 2004. The Saccharomyces cerevisiae aquaporin Aqy1 is involved in sporulation. Proc. Nat. Acad. Sci. 101:17422–17427. Spiropoulos, A., J. Tanaka, I. Flerianos, and L.F. Bisson. 2000. Characterization of hydrogen sulfide formation in commercial and natural wine isolates of Saccharomyces. Am. J. Enol. Vitic. 51:233–248. Trotter, E., C. Kao, L. Berenfeld, D. Botstein, G. Petsko, and J. Gray. 2002. Misfolded proteins are competent to mediate a subset of responses to heat shock in Saccharomyces cerevisiae. J. Biol. Chem. 277:44817–44825. Tsien, RY. 1998. The green fluorescent protein. Ann. Rev. Biochem. 67:509–544. Varela, C., J. Cardenas, F. Melo, and E. Agosin. 2005. Quantitative analysis of wine yeast gene expression profiles under winemaking conditions. Yeast 22:369–383. Verwaal, R., J. Paalman, A. Hogenkamp, A. Verkleij, C. Verrips, and J. Boonstra. 2002. HXT5 expression is determined by growth rates in Saccharomyces cerevisiae. Yeast 19:1029–1038. Wach, A., A. Brachat, R. Pohlmann, and P. Philippsen. 1994. New heterologous modules for classical or PCR-based gene disruptions in Saccharomyces cerevisiae. Yeast 10:1793–1808. Wieczorke, R., S. Krampe, T. Weierstall, K. Freidel, C. Hollenberg, and E. Boles. 1999. Concurrent knock-out of at least 20 transporter genes is required to block uptake of hexoses in Saccharomyces cerevisiae. FEBS Lett. 464:123–128. Ye, L., J. Berden, K. Van Dam, and A. Kruckeberg. 2001. 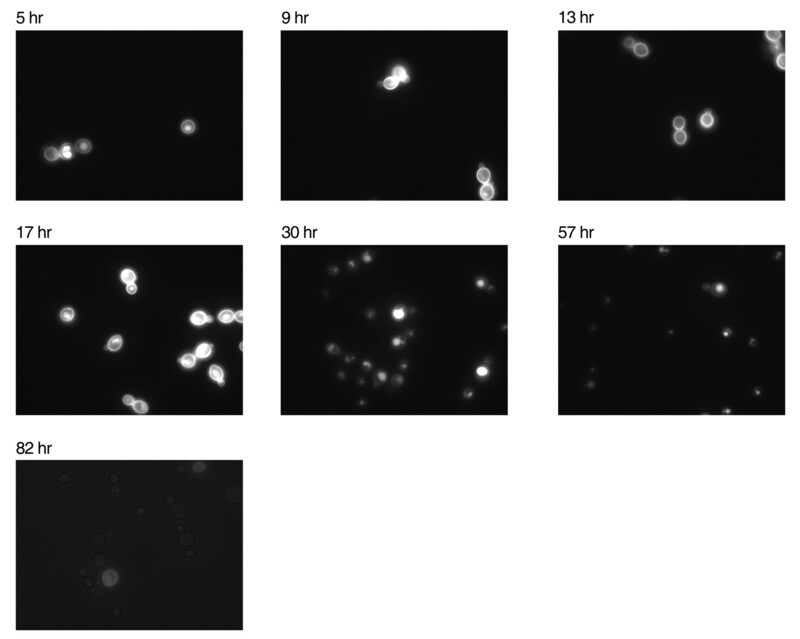 Expression and activity of the Hxt7 high-affinity hexose transporter of Saccharomyces cerevisiae. Yeast 18:1257–1267.